Are you familiar with our medication packaging and ordering options? 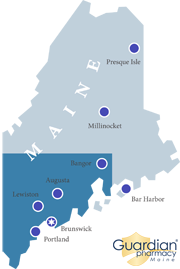 Guardian Pharmacy of Maine’s Multi Dose Adherence Packaging (AdherePac™) program provides individual pouches automatically dispensed and sealed in strips for each resident, into time-and date-specific pouches. This process ensures the highest level of accuracy, safety and efficiency. With this packaging option, we can help your residents switch to a once-a-month or twice-a-month fill cycle for all their routine, oral solid prescribed medications. If AdherePac™ is not the right solution for your facility’s needs, we can also provide you a once-a-month automatic fill cycle packaged in our traditional unit dose blister cards. Guardian Pharmacy of Maine will work with you to determine if Cycle Fill or Anniversary fill is the correct option for your facility.